From a distance and even to the untrained observer, the drop handlebar is the giveaway that the bike is meant for the road. Arguably, this is a misconception since there are many instances where a dropbar might be used on something other than a road bike. “Pandering to women cyclists” might sound dismissive, yet I don’t mean to imply that there are not average morphological differences between men and women that are best accommodated by gender-tailored products. But there is no reason for a woman to buy a handlebar because it is labeled “women-specific”. Not unless it fits her. That is to say, women on average have smaller hands, narrower shoulders, and shorter arms and torsos than men, so it would make sense that she might look for a handlebar that has less reach, less drop, and a narrower width. But the numbers alone do not complete the picture, and there have been plenty of dropbars that were marketed as women-specific or especially ergonomic that were in fact horrible. First, perhaps we should consider whether it is even valid to assume that there is an “ideal” handlebar width for a given rider. Historically, handlebar widths have followed trends. Forty to fifty years ago, handlebars tended to be quite narrow by todays standards; 38-40cm centre-centre on road bikes was quite common even for taller riders and 44cm was rather rare. By the 1980s, quality dropbars such as Italian brands 3T, Cinelli, and ITM had settled on 40-44cm as the standard range. In the 1990s, Grant Petersen of Rivendell Bicycles became something of a tastemaker for non-racers; he argued that dropbars should be wide, perhaps as wide as 48cm c-c. I’ve spoken to Jan Heine of Bicycle Quarterly about the subject, and he contends that wider handlebars followed trends in steering geometry. He pointed out that some of the older French cyclo-touriste bikes had bars as narrow as 36-38cm with low trail steering. As another twist to the narrative, as professional bike racers become more concerned with aerodynamics, a number of riders, particularly powerful sprinters, have chosen relatively narrow bars in an effort to improve drag coefficients. What should you take from all this? That handlebar width has been influenced by trends and prevailing theories of bike fit. It is certainly logical to choose a narrower bar if you are a smaller rider, but there is some conjecture about if there may be an ideal width for you. As Jan pointed out, bike fitters have been using the “width of the collar bone” rule for decades, but somehow they used to come up with smaller numbers back in the day. Personal preference may justly be a factor. As for reach and drop, these dimensions should take into account overall rider height, flexibility, hand size, and component (lever model) choice. 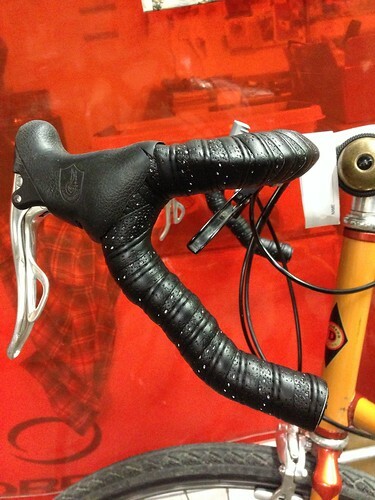 Here’s where so many handlebar designers have gotten it so wrong. Pictured below is one of my most hated handlebars, the Ritchey Biomax II, which is in the category of “anatomic bend” handlebars. Notice how sharply the bar bends below the hood, creating a distinctly acute angle. This bend does achieve a short drop but as a consequence the palm of the hand is moved up and back some distance, making the reach to the levers’ controls all but impossible for small hands. Only an adjustable reach feature in the lever can mitigate the problem, but there were no such levers on the market when the bar was originally produced. 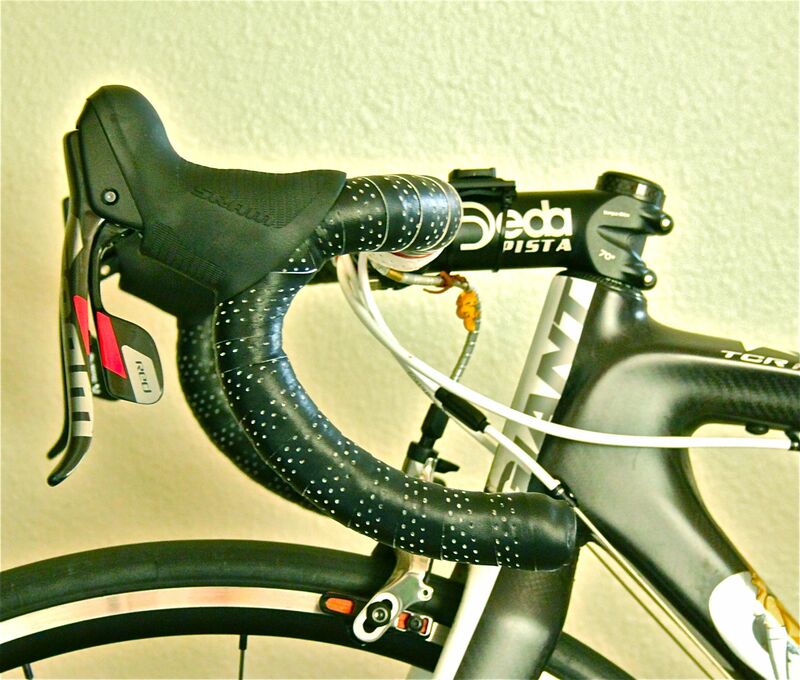 On a handlebar such as this, a rider with small hands can really only use the drops on flat road sections, whereas ideally one would like to be able to use the brakes/shifters in the drops for technical cornering and descents. 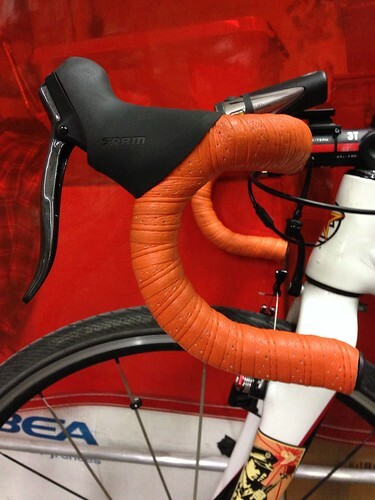 Below is a Pro Vibe 7s handlebar in the round bend style (there are also anatomic and compact bend versions). This style of bend does move the palm of the hand down and forward, requiring more flexibility from the rider, but it gives the best access to the controls when on the drops. In the photos I have positioned the lever body high enough to create a flat transition from the ramp of the bar to the hood; in fact the Pro Vibe Round bar is a slight variation from a traditional bend so that it can better achieve that flat transition. This contour is a good goal for comfort when using the tops of the bar near or on the hoods. I have adjusted the reach of the lever blade just enough for my fingertips to securely wrap. Two other bars on the market that have similar modified traditional “round” bends are the 3T Tornova and Fizik’s Cyrano handlebar in the “Snake” bend. I fit my Redline Conquest Carbon cyclocross bike with the Pro Vibe round bar because the stack of the cyclocross fork puts the bar significantly higher than my road bikes. This is more of an issue with very small frames like mine, where manufacturers generally will slope the top tube higher rather than reduce the already short head tube. My road bikes generally have 105mm-110mm head tubes with integrated/internal headsets atop typical road forks (370mm axle-to-crown). My 48cm size Redline has the same 105mm headtube, but the fork is 25mm taller. The higher position while riding on the hoods makes sense for technical riding offroad but I like that the round bend allows me to get almost as low as my road bikes when I sprint from the drops. By far the most popular drop shape on the market today is what is referred to as a “compact bend”. A more accurate description would be “variable radius” because it is actually the most straight forward description. The radius of the drop starts out very small below the ramp, which is what allows the lever to have a flat transition to the ramp. But then the radius of the bend smoothly increases as the it descends and curves back, until it is largely straight at the bar end. 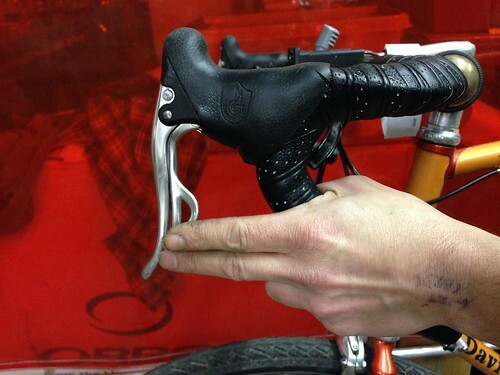 This allows the rider’s hand to sit closer to the lever blade than it would on an “anatomic” bend, but doesn’t effectively drop as low as a round bend. This style of bend offers the best compromise between reduced reach/drop and access to the lever while in the drops, but even then there are a number of variations within this style. Some like 3T’s Ergonova bar sacrifice lever access for reduced drop (in fact, the Ergonova is my least favourite of compact bends, being the closest of the compacts in shape to the Biomax anatomic). My two favourite compact bend handlebars are the current FSA compacts (Wing Pro Compact, etc) and Deda Elementi (any bar with the”RHM” bend). Both of them have reach measurements in the 75-80mm range and drop of about 130mm. There are some handlebars out there, such as Bontrager’s VR-S, have even shorter reach/drop measurements (70/120mm for the Bontrager product), though I think that Salsa’s Pro Road Small 2 Bar (76/106mm) is so small that a lever can only sit rather awkwardly on the bar. 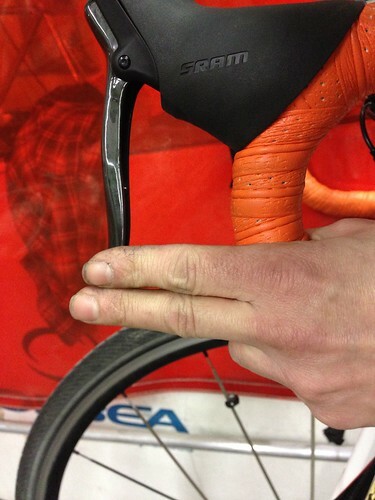 Specialized makes some “women-specific” handlebars that do in fact have a practical shape for people with small hands.